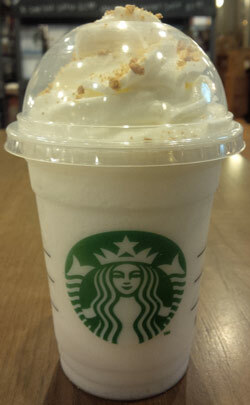 [New for 2015] ‎With the S'mores Frappuccino review doing so well, I decided that we should keep reviewing Starbucks newer options. In celebration of the frapp's 20 year anniversary, they recently made 6 of their secret menu frapps available for order in all their stores. They also are giving customers the opportunity to vote on their favorite to make it onto the permanent menu. Since I'm nothing but a perfectionist, I decided to try all 6 (not at the same time and with the help of a pretty girl) for science! Let's do this review by starting with my least favorite and finishing with the frapp that would get my vote to stay on the menu. First off, my Starbucks was out of the caramel sugar sprinkles so the barista offered to top it with either caramel sauce or graham cracker crumbles. Honestly, I had no idea why they want to use any caramel products with this flavor so I opted for the graham crumbles. 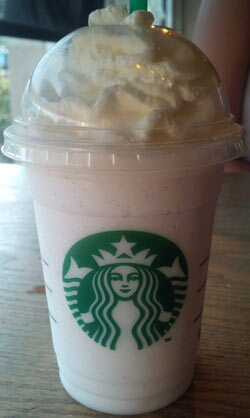 They were actually what I thought this frapp was going to be topped with to begin with until I read the description. In short, this is one weak flavor. The lemon is so mild it tastes mainly of vanilla. It's not bad but I'd like a lot more lemon. Give me a slight pucker or something, this just gives you a faint lemon flavor with very little relation to an actual lemon bar. Oh and the graham crackers added nothing being in the whipped cream and all. I guess those caramel bits would've had the same effect as well. This one suffers from the same downfall as the Lemon Bar, it doesn't really resemble it's namesake all that much. 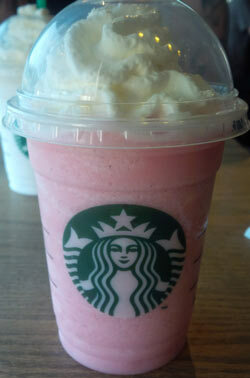 This tastes like a very sweet raspberry drink. Cotton candy has a unique flavor and it's just not here. Maybe it could be raspberry flavored cotton candy but it doesn't remind me of the traditional blue and pink confection you can get from any fair. Still tasty but nothing like cotton candy to me‎. Like the Lemon Bar, there was a mix up in ingredients here. My cocoa part (the mocha drizzle) was replaced by a caramel drizzle. I don't think they were out of the ingredients this time but just that the barista wasn't sure how to make it. Heck, if you didn't know Starbucks released these 6 flavors, you'd never know they had them available. None of the 3 different Starbucks, two of which were in a different state, had any sort of promotional advertising for these frapps. I was nervous ordering each time because there's nothing worse than ordering from an unofficial menu and getting denied. Okay, tangent over. ‎This one is one of the 2 that has coffee involved and it's known from the start. 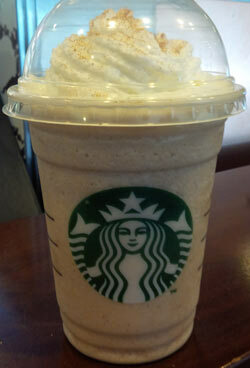 This one reminds me a lot of the now discontinued caramel flan frapp. 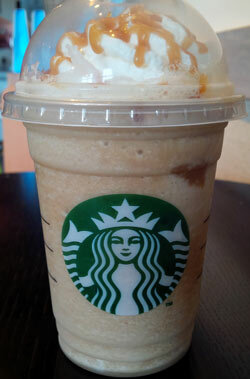 It tastes like every caramel coffee product in existence with a slight toffee aftertaste. Not sure if the mocha drizzle would've added much but the cocoa component was definitely missing here. Not bad but they didn't reinvent the wheel or anything here. These next three were really close together when it came to rankings. ‎I would easily buy any of these three again (okay, technically my girlfriend bought two of them. She's much better at choosing than me apparently). Nothing about this one resembles Red Velvet Cake at all. This one tastes much more like chocolate covered raspberries and it was delicious. There's not much more to say about this one. If you're looking for red velvet, look elsewhere. If you want a raspberry and chocolate fix, this one is for you. I know I took my fair share of sips from her cup on this one. This one was excellent and by far my favorite when it comes to coffee. The coffee flavor is mild and it actually tastes a lot like a cinnamon roll. A cold, liquefied cinnamon roll. You can even taste the icing that's normally on top of a normal cinnamon roll. I'm going to guess that has to do with the white chocolate mocha sauce. The only thing that's missing here is the fresh baked smell and warm gooey factor. For a drink, this is as close to a cinnamon roll as you're going to get. Great job Starbucks fans who made this one a reality. In all honesty, I had very low expectations for this. I mean how does vanilla bean and hazelnut equal a cupcake? Well my friends, it does. This takes the cake! (puns for days) This literally tastes exactly like cake batter and it is perfection. It's not overly sweet either which makes it dangerously easy to drink. Once again, my girlfriend ordered this and I drank far too much of it on my own. It deserves a spot on the permanent menu, without a doubt. 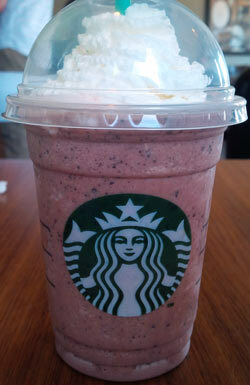 If you try only one of these 6 frapps, make sure it's this one. There you have it, all 6 of the fan flavors from Starbucks. While all of them are good in their own respects, my top 3 are the ones I would recommend to anyone. Good news, even if your favorite flavor doesn't win, there's a good chance the Starbucks employee will know how to make the Frappuccino once it makes it way back to the secret menu. I think this was a clever way to get their customers involved in trying these secret menu options and making it easier on their staff to accommodate those who try ordering from it. If that's the case, GG Starbucks. If you're reading this, it's too late. Oh wait, I'm not Drake. It's not too late to try these and get your vote in! Okay, back to ice cream tomorrow! What a shame they didn't use mocha sauce for your Cocoa Caramel Cluster - it really does add a lot! Rather than tasting like caramel flan, the mocha made mine remind me exactly of their Salted Caramel Mochas available only in the colder months, and for that reason it was easily my favorite! The Red Velvet and Cotton Candy ones really disappointed me because I don't like raspberry; I thought the Cotton Candy one especially tasted like medicine. The Lemon Bar Creme reminded me of a less impressive Frosted Lemonade from Chick-fil-A, and the Cupcake Creme reminded me of the sweet leftover milk from Cap'n Crunch's Sprinkled Donut Crunch cereal and was easily my second favorite right behind their Cocoa Caramel Cluster (seriously, you need to order it again and try it the right way). An added note, maybe it's just me, but between the vanilla and slight nuttiness from the Cupcake Creme flavor, it slightly reminded me of Taro! The Cinnamon Roll I ordered twice hoping to taste more of the white chocolate sauce, but both times the cinnamon flavor dominated the beverage and while I enjoyed it, I honestly couldn't taste a difference between that and the regular Cinnamon Dolce Frappuccino. You are such a champ to review all six!!!! BRAVO! If you need to counterbalance them with something quite different... you should consider reviewing the new So Delicious Cashew Milk flavors. I really cannot afford to buy them, especially if they aren't worth the $6.99 at my WHF, because being gf, dairy free, soy free (for health reasons.. boo) is crazy expensive. Anyway, keep up the great reviews! This is one of my favorite sites to read everyday--especially because I cannot have regular ice cream anymore. Caitlin, thanks for your feedback! I'll definitely have to give that one a retry in the near future.